Lenti-X™ CRISPR/Cas9 System은 lentiviral-mediated CRISPR/Cas9 genome editing을 위한 모든 구성품이 포함된 complete system이다. 본 제품은 고역가의 렌티바이러스를 생산하는 Lenti-X™ Packaging Single Shots과 Cas9 단백질, sgRNA를 발현하는 두 개의 플라스미드로 구성되어있다. 목적 유전자를 타겟하는 sgRNA를 발현하는 pLVX-hgy-sgRNA1 plasmid는 이미 선형화 되어있어 아주 쉽게 sgRNA 서열을 삽입, 라이게이션을 진행할 수 있다. Lentivirus를 이용하여 sgRNA와 Cas9 gene을 삽입하면 일반적으로 Transfection이 어렵다고 알려진 세포주에서의 CRISPR/Cas9 genome editing이 가능하다 (그림 1). Lenti-X™ Tet-On 3G CRISPR/Cas9 System은 doxycycline을 이용하여 Cas9 발현을 유도할 수 있는 Tet-on 3G inducible expression 제품으로써, doxycycline 처리 시 Cas9 단백질을 발현한다. Cas9 발현을 엄격하게 조절할 수 있기 때문에 영구적인 Cas9 단백질 발현으로 인한 off-target effect나 세포 독성을 줄일 수 있다 (그림 2, 그림 3). 그림 1. Either Jurkat or HT1080 cells were first transduced with LVX-hyg-CD81-sgRNA and then selected for stable integration using hygromycin. Stable clones were then transduced with LVX-puro-Cas9. Stable clones were selected for using puromycin and then screened for CD81 knockout efficiency using FACS. Positive and negative controls of parental cells without Cas9 transduction were done either with or without anti-CD81 antibody. 그림 2. Inducible knockout of CD81 in HEK293 cells. Target cells were first transduced with Tet-On 3G lentivirus and selected with G418. Cas9 induction was then assayed by Western blot using polyclonal anti-Cas9 antibody (Code 632607), diluted 1:1,000, and ECL reagent. Panel A. 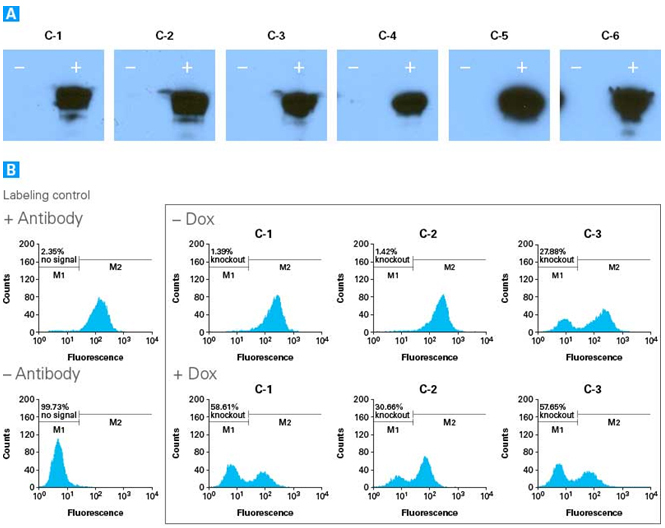 Western blot results for six independent Tet-On 3G-Cas9-positive cell populations cultured in the absence (-) or presence (+) of 0.5 μg/ml doxycycline, assayed with anti-Cas9 antibody. Panel B. FACS results for three independent Tet-On 3G-Cas9-positive 293T cell populations transduced with CD81-sgRNA lentivirus and cultured in the absence (-Dox) or presence (+Dox) of 0.5 μg/ml doxycycline. 그림 3. Inducible editing of AAVS1in HEK293 cells. 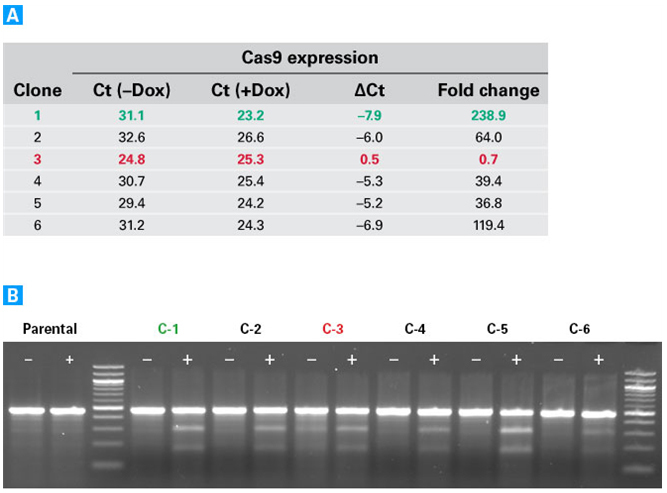 Induction of Cas9 expression in six stable Tet-On 3G-Cas9-positive HEK293 cell lines was assayed by qRT-PCR. The Guide-it Mutation Detection Kit (Code 631443) was then used to screen for editing of AAVS1. Panel A. qRT-PCR results for Cas9 expression in uninduced (-Dox) and induced (+Dox) cells for each clone. Panel B. Results of Guide-it resolvase assay for detection of AAVS1 gene editing in uninduced (?) and induced (+) clones.